Update: Good news for people in the UK - the G Watch R is now available to order. Clove is selling the smartwatch for £224.9, while Unlocked Mobiles has it for £229.98. It's unclear when your order might arrive, but Unlocked Mobiles is currently promising next day delivery. The wait for the LG G Watch R is nearly over. 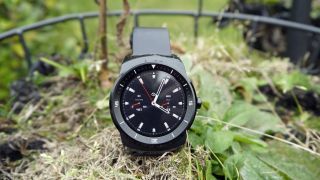 LG has announced that its latest and first round wearable will being selling across Europe - from France, Italy, Spain, and the UK - this November. Meanwhile, sales in North America, Asia and more territories will begin soon after. Meanwhile, sales in North America, Asia and more territories will begin soon after. The LG G Watch R made its debut at IFA 2014 shortly after the Moto 360. Despite being the second round-faced smartwatch, it still managed to steal the show with a completely round display. The Moto 360 has a small cut off chin at the bottom to make way for an ambient light sensor. The LG G Watch R does not just look good with it's classic luxury watch styling, it also features a 1.3-inch circular Plastic-OLED display with a 320 x 320 display resolution. Underneath the rounded display there's also 1.2GHz Qualcomm Snapdragon 400 processor and 512 MB of RAM. As the G Watch R watch can run Google Wear apps users will also have access to 4GB of onboard storage. The watch is also equipped with a small array of biosensors as well as a built-in barometer so you don't get caught in the rain – and in case you do it's waterproof. Lastly the watch connects to smartphones over Bluetooth 4.0.